The aroma of cinnamon and baking cookies is part of our childhood memories of Christmas. Sugar cookies in the shape of Santa or gingerbread men with pretty icing made Christmas time wonderfully sweet. Baking together during the holidays with young and old is a lovely tradition that creates a particularly cozy atmosphere, especially with today’s hectic pace. And Christmas without sweets would only be half as nice. 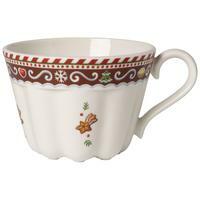 Let the Christmas bakery of Villeroy & Boch inspire you and help you find ideas for your Christmas cookies and sweets. The various pieces in our Winter Bakery Delight collection add magic to your Christmas baking: Motifs with loving details of gingerbread, Christmas cookies and candy canes stir childhood memories and make us want to get out our mixing spoons and make all kinds of cookies. When the cookies are finished, they’ll receive a place of honor on a tiered serving tray while the cookie containers with Christmas motifs from the past will keep them fresh until the last crumb is swallowed up by anyone with a sweet tooth. Christmas time is cookie time: Does the fragrance of Christmas cookies send you back to your childhood? Then pass the tradition on to your loved ones. When you bake together at Christmas time, not only do you nibble on cookie dough, you are also helping to make cookie masters for the future - if they are allowed to help. It’s easy to make baking cookies with children at Christmas time a success: Choose a recipe with ingredients that make quick and easy Christmas cookies that allow your little ones to help stir, knead and roll out the dough themselves. We have collected delicious Christmas cookie recipes for you for your holiday baking: Vanilla kifli, honey gingerbread, sugar cookies, and more. Our Toy’s Fantasy collection is sure to have just the Christmas dishes you need for serving your favorite Christmas baked goods. Christmas baking was never so easy. Beside traditional Christmas cookies, these original and fast little Advent cakes are a favorite in the Christmas bakery: cup cakes. The cups in the Winter Bakery Delight collection make perfect baking forms for preparing them. Just fill the stirred batter into the cups, pop them in the oven to bake and enjoy Christmas.